When the time comes to choose a roofing material for a new construction project or renovation project, various products are available to you. You have the choice between asphalt shingles or metal sheets. 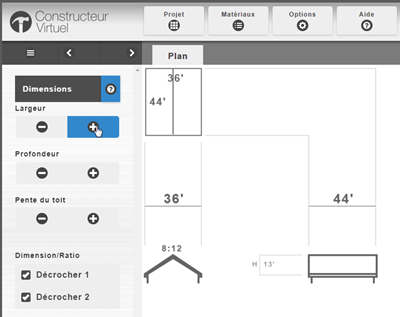 With the new Roofing app from Virtual Constructor you can now estimate the quantity of products and accessories as well as the price for your construction or renovation project. Live the ultimate online roofing estimating and planning experience using our new simple to use application. This innovative technology will enable you, in a few clicks, to compare products and roofing materials as well as their respective prices automatically and instantaneously. At the end of the process, it is easy to save multiple versions of one project and when the time will come to go from planning to making, it is as easy to ask for a quote to your local hardware store using our online form and a geolocalizing map. No software installation required, no plugins to download and the application works on all web and mobile platforms. Now that is good news, worthy of sharing with your friends which may also have roofing renovation or new construction projects to plan, estimate and carry out in the next year.